- 4 minutes walk to the new Capitol Hill light-rail station OPENING March 2016! NOTE: If this unit is booked for the dates you require we have three other great apartments in the same building you may want to consider... Listing #170468, #192297 and #181817. Is stylishly furnished with all the comforts of home, it is the perfect place to relax and unwind after a busy day; watch a movie, enjoy a glass of wine or entertain family or friends in this spacious apartment. The Harrison Modern has 4 wonderful apartments to offer in a quiet, well designed, refurbished, Mid-Century building. For your privacy each unit has a separate entrance; 1111 – 1117 E. Harrison Street. I have lived in the building for 16 years and the neighborhood for 21, I would be happy to give you a local perspective on sightseeing or dining in the neighborhood during your stay. I have owned and lived in the Harrison Modern since 1997. I have a passion for architecture and interior design, you will see this in every aspect of the building. Originally born in New Zealand, I have traveled the world and the US extensively, I believe that Seattle is one of the most beautiful cities on the planet. My back ground is in Tourism Marketing, I worked for the New Zealand Tourism Board in Los Angles for 8 years before moving to Seattle in 1994. I have a love of travel and new experiences - Whenever I away I always stay at vacation apartments, as you get a real feel for the destination you are visiting. Seattle is a vibrant city full of amazing sights from world class architecture, vibrant arts scene, to spectacular outdoor activities. Capitol Hill, is the perfect location to explore all Seattle and everything the region has to offer. If you are not traveling outside the city you won't need a car, everything is within an easy walk or a short bus ride. Within 3 short blocks of the building are a a number of great restaurants, shops and cafes, 2 supermarkets and 3 wonderful city parks. Capitol Hill is a rich, diverse, neighborhood with multi million mansions and a wonderful farmers market within blocks of each other. One thing I am sure about... You will love the location. I have done a lot of traveling and believe that Seattle and the Pacific North West is one of the most beautiful, livable, areas in the North America. Location, Location, Location... Capitol Hill is the most convenient neighborhood to downtown Seattle. from our building it is a lovely 15-20 minute walk to downtown. The building is super stylish, all the apartments are large and individually furnished in keeping with the mid-century contemporary theme. 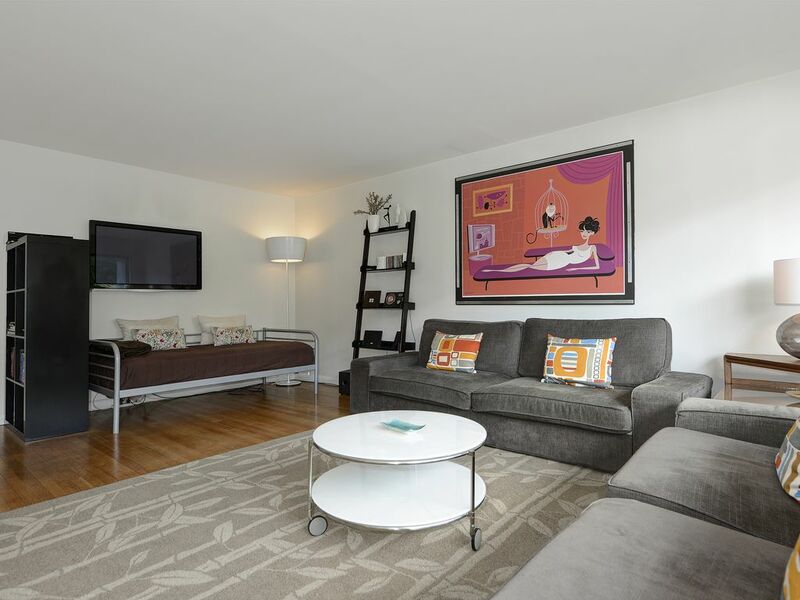 Comfort, convenience, and style are what you will find when you stay at the Harrison Modern. Holiday rates may vary. Off-street parking is available for $10/night. Additional guests over 2 are $10/per person per night.